Using the wedges, lift up the tiles to positioned to the left and right of the broken one. Tilt the broken tile sideways in order to separate it from the tiles with which it is interlocked. Then lever the tile upwards to release it from its clip, while being careful not to disturb the tiles that aren’t broken. If the clip stays in position, the replacement tile may slip into the empty slot with no problem. If on the other hand the clip has been dislodged, there is little need to replace it as a few missing clips will make little difference. If your tile is nailed in, use the slate ripper to remove any nails or cut the wire before removing it. Place the broken tile in the empty bucket and use the attached rope to lower it to the ground to the person helping you with the job. Take the replacement tile and slide it into place, before pulling back the tiles that were previously pushed out of position in order to accommodate the removal of the broken tile, and the remove any wedges. 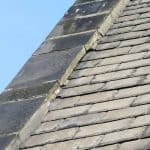 The roofers at DPR (Pontefract) have built an outstanding reputation for the quality of their roof repairs over the 20 years the company has been in business. So, for a local roofing company you can rely on, call DPR’s Pontefract roofers now on 01977 220016.